Vampire bats are misunderstood creatures. They are loving, and social, and even altruistic. One of their prime altruistic attributes is their willingness to generously vomit your blood into each others' mouths. But why are they so magnanimous? Perhaps its an overstatement to say that vampire bats, Desmodus rotundus, share your blood. 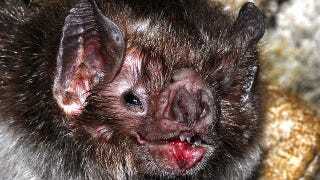 Odds are you've never been near a vampire bat. Even if you have, they tend to prefer wild animals, pigs, goats, and, when they can get their fangs on them, cows. Desmodus have even evolved the ability to break into a sort of hopping gallop, which they use to run along the ground and bite at the feet of sleeping cattle, just above the hoof. Not all of the bats dine on cow every night. Young bats, still caught between nursing and hunting, will often come home with an empty stomach. Their mothers feed them by regurgitating blood right down their adorable little throats. Scientists believe that this gives the babies two advantages: nutrition, and the chance to get a dose of the beneficial gut bacteria in the mother bat's stomach. After some observation, though, researchers noticed that the bats didn't always restrict their loving vomit to their own offspring. Vampire bats tend to gather in female groups. They'll all roost together during the day, usually in hollow trees. Female offspring will grow and join their mother's group, but not all the bats in a group are related. Regardless, unrelated bats will "share" blood. This confounded researchers, as unrelated females are competition for food and for mates. What did any bat get out of feeding a stranger? What they get is the chance to have a meal the next time they come home to the roost with an empty belly. Scientists set out traps and caught a group of bats from the same roost, some of which had fed and some of which hadn't. The researchers held them until daybreak, and then let them fly back to the roost. There, the scientists found that most of the unfed bats almost immediately got a meal of sweet, sweet blood-vomit. Some of the hungry bats, though, did not get fed. After observing the group for days, scientists determined that getting a good meal depended equally on two independent factors: kinship and reciprocity. The bats looked after their families. They also formed mutual support groups based on which bats among them regularly offered meals to the hungry. The result was a happier and fatter roost than if they didn't generously throw up blood all over each other. Altruism paid off for the bats — just not for the cows.